A ICG canyoneering backpack sets the standard for comfortable, intelligent, and durable design in the brutal canyon environment. Our Heaps packs ride as smoothly as backpacking packs, but sacrifice unneeded bells and whistles to deliver sleek, technical performance. The packs shed water quickly, rarely get caught up on canyon debris, and are big enough to stow everything we need on long guided days. 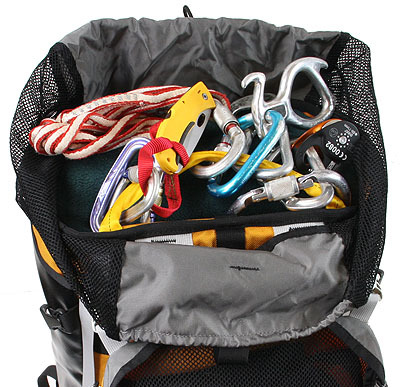 Here in America, a canyoneering backpack must be both effective and sufficiently durable for the rigors of the sport. We have combined - HYBRIDIZED - the best of American-style, sophisticated Cordura nylon packs with durable plasticized PVC-laminate fabric to produce packs that do both - work AS PACKS, and resist rapid destruction. 16 oz PVC Laminate: what a canyon pack is made of: Polyester mesh laminated between two layers of PVC. Used selectively on our packs to provide "armor" in key places. Properties: Hydrophobic, very tough and abrasion resistant, stiff, sews poorly, shapes and drapes poorly, can be (and is, where appropriate) perforated with holes that will not run or fray. Ours is Black only, and used on the bottoms and bottom-sides of packs. As packs get bigger, the number of panels done in the PVC are fewer, to lessen the weight penalty. The Mystery uses less, the Lep none at all. 1000 denier Cordura: what burly backpacks are made of: high quality, air-textured nylon yarns, tightly woven, urethane coated. 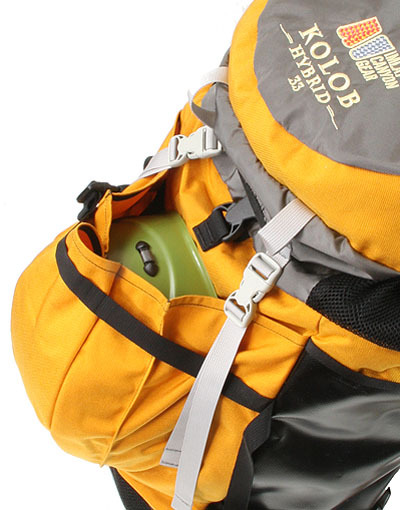 Forms much of the outside of our packs, especially where abrasion is expected. Properties: Sews well, shapes well, drapes well. 13 oz per square yard. It is the COLOR component of our packs. 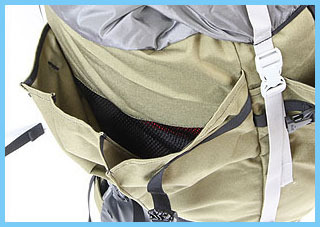 Pleated outside pockets on all models (except Lep) are Cordura, where a few holes are not a big concern. 420 denier nylon packcloth: black, softer, "less" fabric used in panels that don't get much abrasion, such as the top of the lid and the drawcord neck. Also used on the Heaps back panel for greater comfort against your back, and to save weight (reinforced at the top and bottom with Cordura). 13 oz Polyester Mesh/6 oz Polyester Mesh: sturdy open-weave, non-running mesh. Our packs are made double layer - an outer layer of armor-like fabrics, and an inner bag of mesh. This system allows water to funnel down to the bottom of the pack and exit easily and quickly. 13 oz is used for primary panels, 6 oz used for interior panels such as the Water Tank pocket. Nylon 3-D Mesh: suspension parts are lined with nylon 3-D Mesh for comfort and airation combined with durability. Plastic Buckles: we use the Rocklock series from National Molding, which are sturdy and crisp, and hold up well to abuse. lay flat when not in use, expand to carry stuff, and act as armor to protect the mesh underneath. My design intention is to create more, kinda sloppy but versatile volume to use for the approach, but once you are in the canyon, and have your wetsuit and harness on and are using the rope and other technical gear, the pockets lay flat and stay out of the way. A buckled strap at the top of each pocket holds it closed. No zippers to wear out (quickly). The pocket on the back is sized to hold a Petzl Elios Helmet. Pockets have drains so they cannot trap and hold water. The Heaps has pockets on the side (2) and a large pocket on the back. 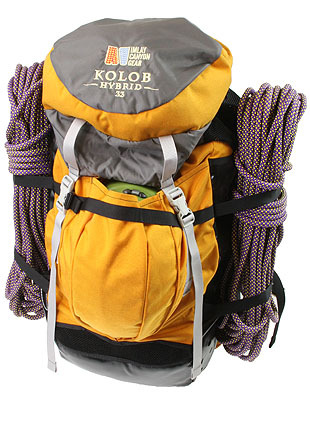 The Kolob, Spry and Mystery have one large pocket on the back. 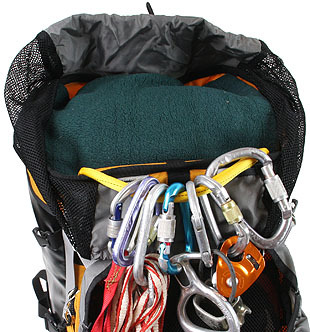 provides an excellent place to put your heavy, cantankerous technical toys, easily found and not in the way on your harness. Your 'rack' CAN be tucked into the watertank pocket, but I've found it better to just flip it toward the lid when I'm getting stuff out of, or putting stuff into, the pack. 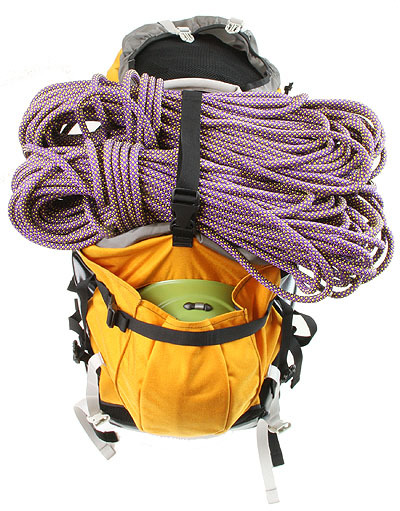 A sturdy strap across the top of the pack is made to assist in holding a rope, when the pack is too full to put the rope inside. Sometimes a better way is to use a Canyoneer's Double-Coil and secure the rope to the sides of the pack, using the compression straps. All our packs have a mesh Watertank pocket against the back panel. An easy-to-use tube exit is positioned at the center top - usable for both righties and lefties. As a small manufacturer, I am, unfortunately, not in a position to make packs in a variety of sizes. I have tried to design the packs to have an exceptionally wide fit range. To some extent, the larger packs fit larger people, and the smaller packs fit smaller people. The Spry and Mystery might fit smaller people a bit better, if you take the plastic sheet out but leave the foam in place. Heaps 5'8" to 6'4" 5'8" to ??? Kolob 5'4" to 6'0" 5'2" to 5'8"
Spry & Mystery 5'0" to 6'0" 4'10" to 5'10"
Leprechaun 4'6" to 6'6" 4'6" to 6'6"
Notes: women vary more in shape than men, but then again, they are used to a worse fit and tolerate it better than men. These represent a starting point - compare to reality to see how "Wild A" my guess is. Imlay Packs are made in the Philippines, using materials made in South Korea.